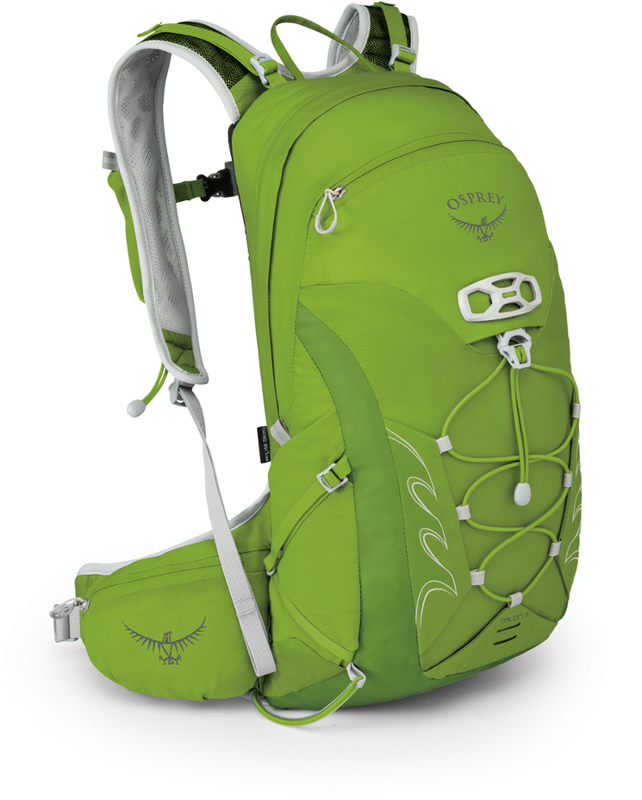 Minimalist, single compartment pack with features that promote function and comfort. Outer zipped pocket and internal hydration sleeve with a drawstring top. 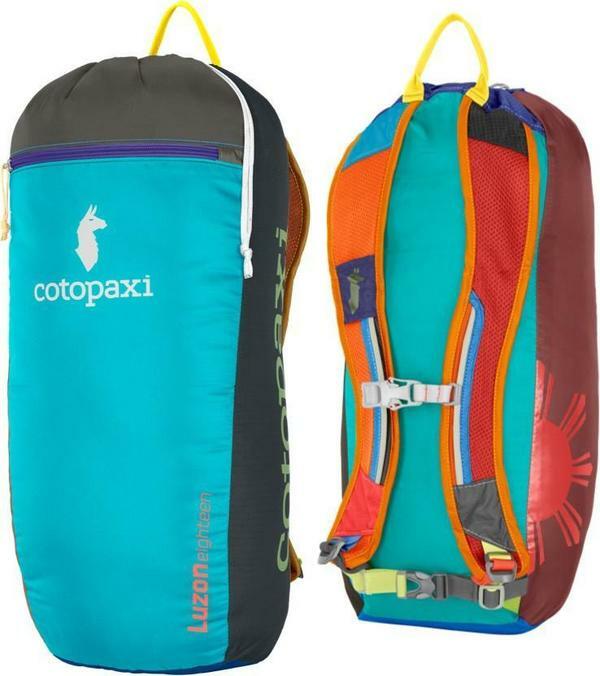 Makes a great day or summit pack, but enough room for UL overnights. 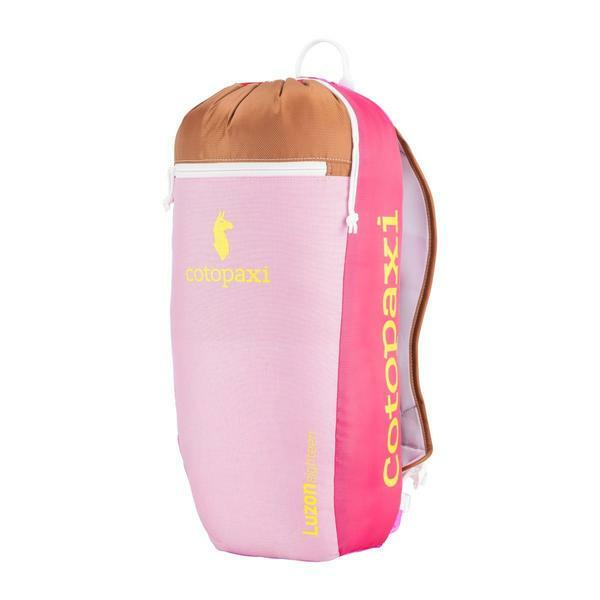 The Cotopaxi Luzon 18L is a small pack that rides well on the upper middle portion of my back. I have an oddly long 21" torso for a man of average height and I find the bottom of the pack sits against my spine about halfway between the bottom of my shoulder blades and the the top of my hips. On shorter torsos I would imagine the bottom would ride just as well against the lower back. The shaped shoulder straps create a yoke that, properly adjusted, wraps around the shoulders without creating any restriction of motion. This close fit keeps the pack in place very well when conditions call for bushwhacking or dealing with duck unders. The sternum strap works really well with the shoulder straps to keep that close fit. 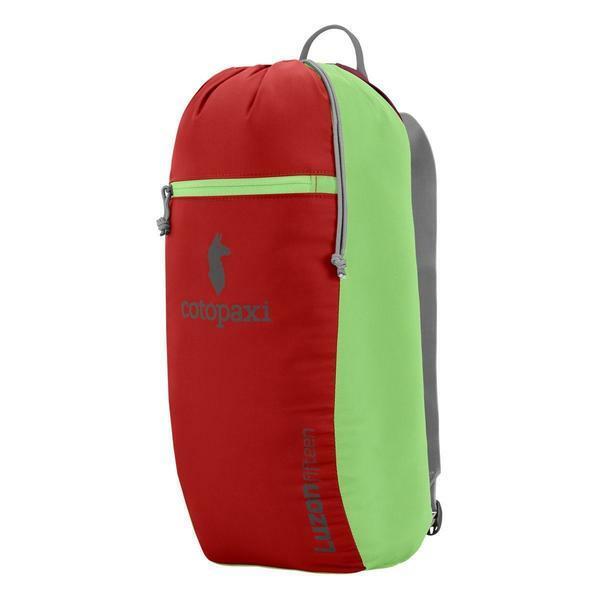 It rides on secure rails on the edge of the shoulder straps allowing about 6" of travel. This lets a person find that sweet spot for their body shape. 18L. There we're done with capacity. Wait, let's take a look at just how big that is. For fun I loaded it up to see what I could fit and was pleasantly surprised at the result. That single compartment means an artful crammer can get a lot into that little bag. 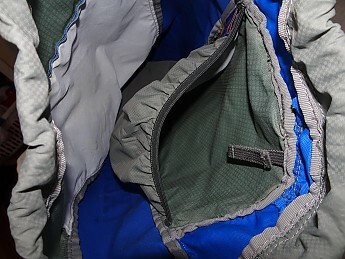 I was able to stuff three-season top and under quilts, hammock, tarp, GSI Micro Dualist and water bottle because they were handy, plus my Houdini Alpha and a wind shirt. With a few tweaks I am sure I could do at least an overnight and maybe two with this bag. Couldn't carry much water, but in the right place with the right weather it could be done. 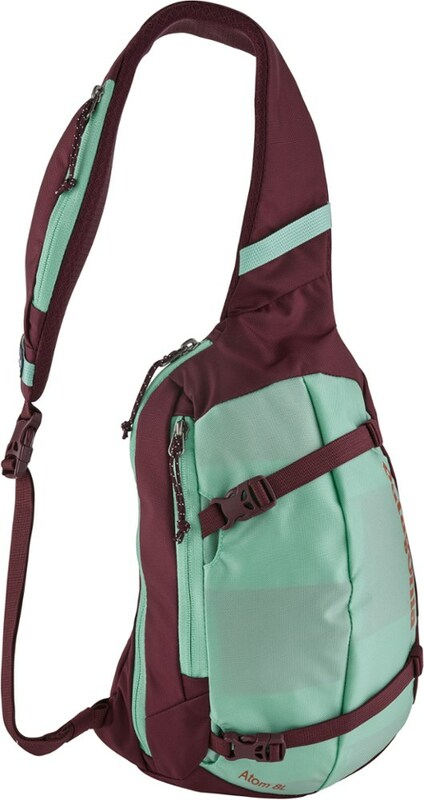 That being said, I found the 18L size to be perfect for day hiking, solo or with family. I could carry snacks for three along with extra clothes and appropriate essentials. 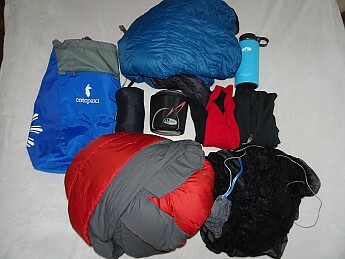 When used as a summit pack on backpacking trips there was ample room for supplies and extra gear. The external pocket is about 7" deep with a zippered opening. This was nice for easy access to electronics, but also could be used to hold a water bottle as seen above. 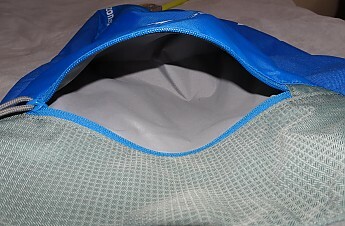 The hydration sleeve included a bag hanger and was designed to keep moisture away from the rest of the pack. 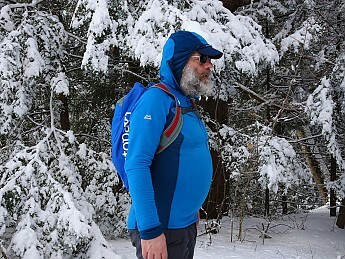 For folks who aren't using it to carry a water bag it makes a great place to tuck wet clothing or rain gear. 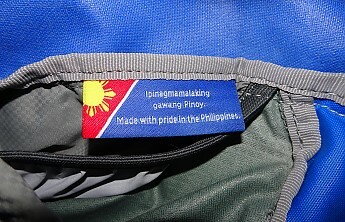 The Luzon 18 is made in the Philippines out of repurposed, rip stop nylon. The design was created to use up extra material left over from constructing other items. The stitching is smooth and even throughout the pack. Stress points have extra stitching, but the shape of the straps works well to reduce material stress. The materials are actually pretty sturdy despite the light weight of this pack. I wasn't able to find info on the weight of the nylon, but it has held up to years of use with only a few stains on the bottom. 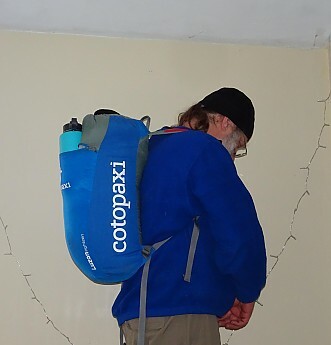 I've used the Cotopaxi Luzon 18L for over three years now. Primarily it has been used on day hikes. 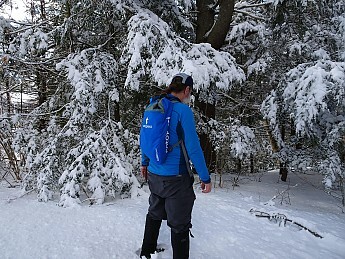 It has also been used as a summit pack and for easy access while dragging a sled in winter. I've also used it to carry additional gear on family trips where I strapped it to the Daddy Pack. When I first received this pack as a gift from Frau Stranger I was of two minds. I really liked the way it looked, but I wasn't sure what I would use it for. At first it only came along on family day hikes. 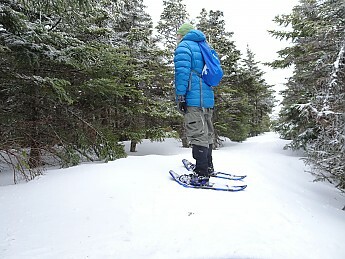 Once I discovered how nicely it worked for snowshoeing, with or without a sled, it started getting out more. The more I used it the more I liked the way it felt on my back. Used for the right job it is very functional, though there are a few drawbacks. 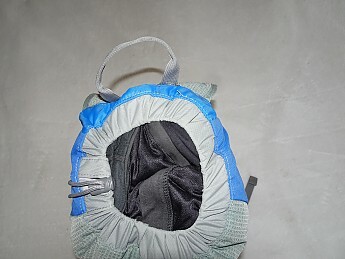 This pic shows the drawstring top opening from my cramming experiment. Fully loaded this was about as far as I could close the top. That is sort of to be expected, since I've put too much in there. In order to cinch the top down tight you have to give up a lot of space. Even then, the small opening in the center is a magnet for any amount of precipitation. If I wanted to keep stuff dry on a wet day I'd need a dry sack inside. That limited when I could use this pack to dry or freezing conditions where liquid water wasn't an issue. The rest of the pack isn't very waterproof anyway. The pack really lends itself to dry conditions rather than rainy days. Those issues made me shave a bit off the score on the Luzon 18L, but I certainly found it to be a functional pack when used appropriately. 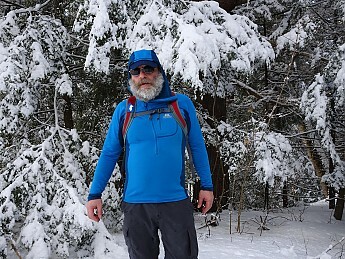 My favorite use is while snowshoeing. It is very easy for me to get on and off, so great for water and snacks. It really stayed with me when bushwhacking through tight trees or crawling under blow downs. That tight ride makes it a great pack for summit scrambles too. All in all, this pack is definitely functional. For my climate, which tends to the wet side, this pack has its limitations. From my days in California I am thinking I would have used this more on the dry trails there. 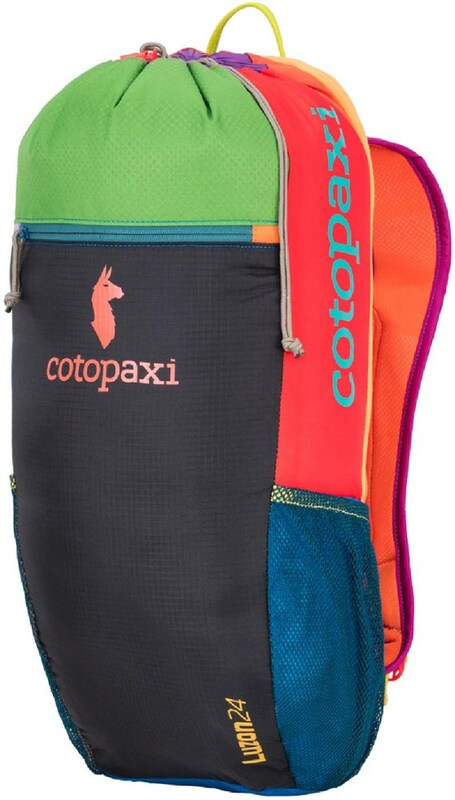 Still, I have had some great times using this pack and think the entire Cotopaxi line is worth a look if you aren't familiar. Much of their gear is of a more urban nature, but they have some very functional and colorful stuff that is up to back country use. hehe Pat I have been known to carry food bags with more capacity. 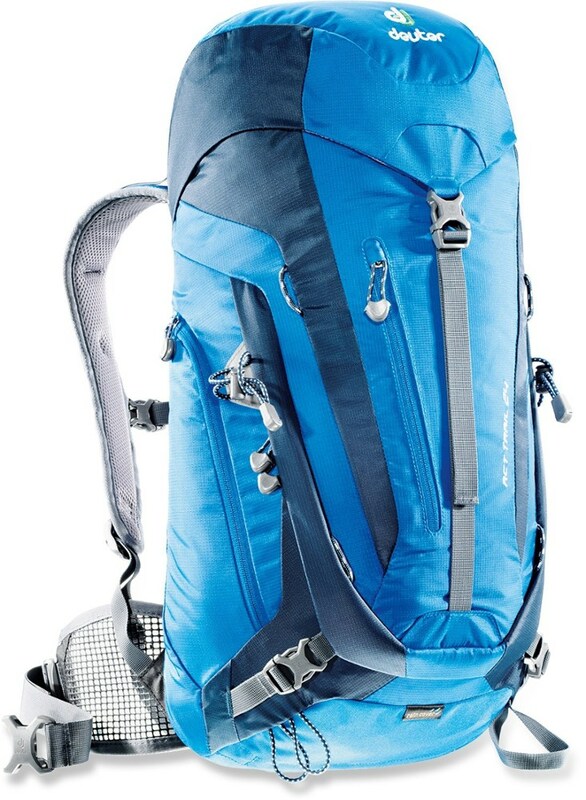 I have the same pack, LS, from when it was given away at an outdoor industry event years ago. It feels cavernous (in a good way) for its 18L size. It is on the long side too. My daughter has taken it over as her nordic ski bag (no, it doesn't hold skis and poles, though we do put her boots and clothing in there).